Bell peppers belong to the nightshade (Solanaceae) family of plants, along with chili pepper, cayenne pepper, eggplant, tomatoes and potatoes (except sweet potatoes and yams). Their scientific name is Capsicum annuum. This scientific name, however, is used to refer not only to bell peppers, but also to wax peppers, cayenne peppers, chili peppers, and jalapeno peppers. While we are most accustomed to seeing green bell peppers in the supermarket, these delicious vegetables actually come in a wide variety of colors, including yellow, orange, red, purple, brown and black. The green bell peppers you purchase in the food market may actually be immature, non-ripe versions of these other color varieties. Not all bell peppers start off green, however, nor do green bell peppers always mature into other basic colors. Paprika is a dried powdered form of bell pepper, and even though we are used to seeing red paprika in the spice section of the grocery, a paprika can be made from any color of bell pepper and it will end up being that same color once dried and ground into powder. Bell peppers can be eaten at any stage of development. However, recent research has shown that the vitamin C and carotenoid content of bell peppers tends to increase while the pepper is reaching its optimal ripeness. Bell peppers are also typically more flavorful when optimally ripe. 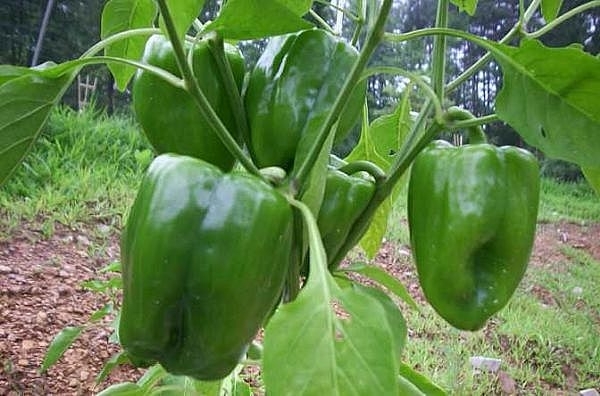 Bell pepper is one of the vegetables in the nightshade (Solanaceae) family, which includes chili pepper, cayenne pepper, eggplant, tomatoes and potatoes (except sweet potatoes and yams). It can be difficult to tell whether a bell pepper is optimally ripe, but from a nutritional and health standpoint, it is definitely worth paying attention to the degree of ripeness in your bell peppers. You don't want them to be overly ripe to the point of getting too soft, wrinkly, or blemished. In fact, if bell peppers are optimally ripe at the time of purchase, they can lose up to 15% of their vitamin C content over the course of 10-day storage in the refrigerator and up to 25% of their vitamin C over 20-days of refrigerator storage time. However, if not optimally ripe at the time of purchase, the vitamin C and carotenoids in bell peppers will actually increase with refrigerator storage over the next 10 days. So as you can see, there is a delicate balance in terms of optimal ripeness! We encourage you not to worry about eating bell peppers that are not yet optimally ripe, because they can still provide you with outstanding health benefits. But for optimal vitamin C and carotenoid benefits, you may want to experiment a little and see if you can develop a skill for evaluating ripeness in this vegetable. Unfortunately, you cannot use basic color as your primary guideline. Most - but not all - green bell peppers will turn red in color over time, but they may be optimally ripe before shifting over from green to red. (There are also some varieties of bell peppers which never start out green.) A good rule of thumb is to judge not by the color itself but by the color quality and overall texture and feel. Whether green, red, yellow, or orange, optimally ripe bell peppers will have deep, vivid colors, will feel heavy for their size, and will be firm enough to yield only slightly to pressure. Unwashed sweet peppers stored in the vegetable compartment of the refrigerator will keep for approximately 7-10 days. . Because bell peppers need to still well hydrated and are very sensitive to moisture loss, we further recommend that you include a damp cloth or paper towel in the vegetable compartment to help the peppers retain their moisture. Do not cut out the bell pepper stem prior to storage in the refrigerator. Bell peppers are especially sensitive to moisture loss through this stem (calyx) portion and are more susceptible to chilling injury if the stem is removed. Sweet peppers can be frozen without first being blanched. It is better to freeze them whole since there will be less exposure to air which can degrade both their nutrient content and flavor. Although most people would not consider washing bell peppers under hot water, we want to be clear about the disadvantages of doing so. A recent study has shown that bell peppers retain more of their total antioxidant capacity when washed under cold versus hot water. Finally, if you are going to consume your bell peppers within a day or two and suspect that they are not fully ripe, you may want to consider storing them without refrigeration. We've seen one recent study showing that room temperature storage of 20°C (68°F) can improve the availability of fat-soluble carotenoids in bell peppers that are not yet optimally ripe. Of all of the cooking methods we tried when cooking bell peppers, our favorite is Healthy Sauté. We think that it provides the greatest flavor and is also a method that allows for concentrated nutrient retention. Bell peppers are an outstanding source of antioxidant and anti-inflammatory phytonutrients. These phytonutrients include flavonoids (luteolin, quercetin, hesperidin) and hydroxycinnamic acids (especially ferulic and cinnamic acids). But the hallmark phytonutrient group found in bell peppers is the carotenoid family, with more than 30 different carotenoids being provided by this vegetable. Included in bell pepper carotenoids are alpha-carotene, beta-carotene, cryptoxanthin, lutein, and zeaxanthin. Bell peppers are an excellent source of vitamin A (in the form of carotenoids), vitamin C, and vitamin B6. They are a very good source of folate, molybdenum, vitamin E, dietary fiber, vitamin B2, pantothenic acid, niacin, and potassium. Additionally, they are a good source of vitamin K, manganese, vitamin B1, phosphorus, and magnesium.